This is no simple salad: It’s a multicourse meal on a plate. Its dramatic presentation is part of the allure. These are some of the best restaurants that you need to add to your culinary hit list in Aruba. Whisk ginger, soy sauce, raw sugar, lime juice, fish sauce, pepper, and garlic powder in a small bowl until sugar is dissolved. Whisking constantly, gradually add olive oil, then sesame oil. Transfer to a small resealable plastic bag and add steaks. Close bag, pressing out air, and turn steak to coat. Chill at least 6 hours and up to 12 hours. Prepare a grill for medium-high heat. (Alternatively, heat a grill pan over medium-high.) Remove steaks from marinade and pat dry. Season very lightly with salt. Grill, turning every 2 minutes, until lightly charred all over and an instant-read thermometer inserted into the thickest part of each steak registers 120° for medium-rare, 8–10 minutes total. Transfer to a cutting board and let rest at least 10 minutes before cutting into 1" pieces. Do Ahead: Steak can be grilled 1 day ahead. Let cool; cover and chill. Cut just before serving. Whisk lime juice, chili paste, peanut oil, fish sauce, sugar, honey, and garlic in a small bowl to combine. Taste and season with salt if desired. Cook noodles in a small pot of boiling salted water until al dente. Drain and run under cold water to stop cooking. Toss with oil in a large bowl. Add mango, arugula, watercress, carrots, scallions, cabbage, tomatoes, and dressing and toss to coat. Season with salt if desired. 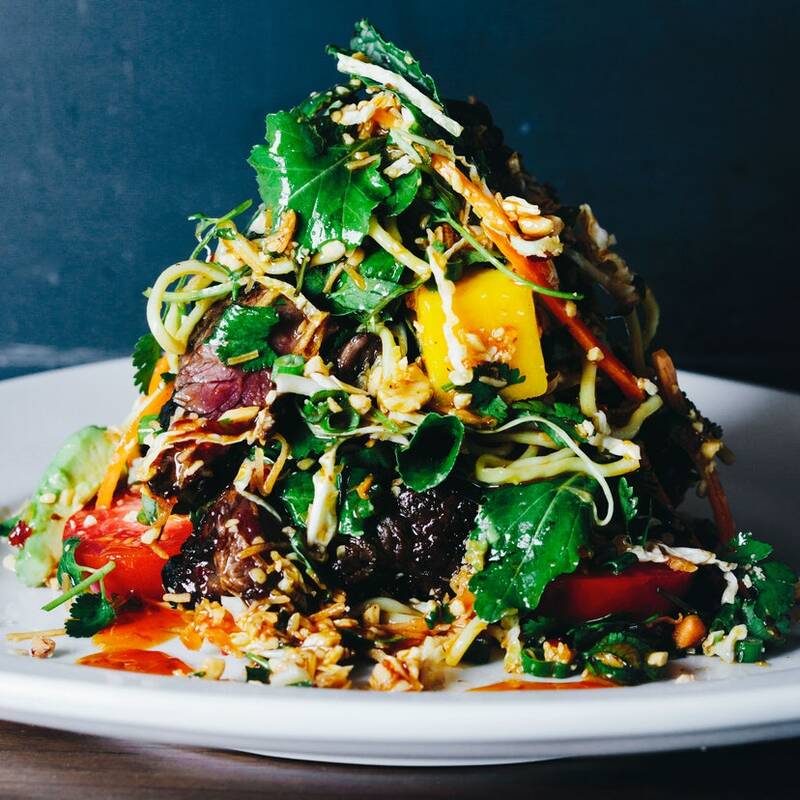 Add steak, avocado, cilantro, basil, mint, coconut flakes, and ¼ cup peanuts. Gently toss just to combine. Divide salad among plates, piling as high as possible. Top with additional peanuts and serve with lime wedges for squeezing over.